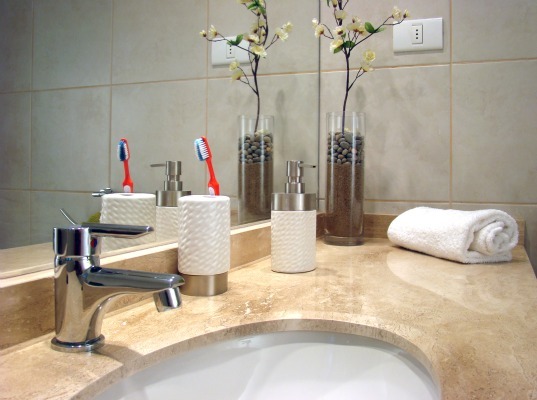 How to Green Clean Your Bathroom Without Toxic Chemicals! No one likes cleaning the bathroom; hair-clogged drains, moisture-loving mildew, and, ahem, the toilet all make for an unpleasant chore. No doubt your first priority when cleaning the loo is eliminating germs and soap scum, but it’s important to steer clear of harsh chemicals that can linger in the air and water, and irritate your skin, lungs and mucous membranes. Just like in the kitchen, most popular disinfecting household cleansers are chock full of harmful chemicals. The EPA classifies 275 of the antibacterial agents commonly used in cleaners as pesticides, some of which have been linked to serious health problems. In the bathroom, we’re constantly coming in contact with all kinds of surfaces, so these toxins can easily get on your skin, and with the next flush of the toilet, the chemicals will flow into the wastewater system, where they can seep into the ground. With diligence and earth-friendly products, you can keep your bathroom clean — and safe — without harsh chemicals. There’s no need to reach for the bleach to get your toilet sparkling white. Homemade, non-toxic bathroom cleaners can de-stain just as well. 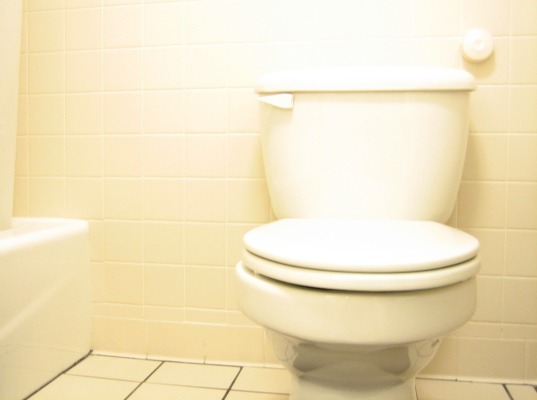 For a spotless toilet, mix together half a cup of vinegar and a spoonful of baking soda. Pour the mixture into the toilet bowl and let sit for about 30 minutes before scrubbing. Repeat once a week. For a simpler one-stop solution, we highly recommend Method’s Lil Bowl Blu. The bleach-free formula detoxes your toilet using lactic acid, naturally removing rings and that gross brown calcium build-up. Battle soap scum with baking-soda paste! By mixing baking soda and all-natural dish soap, you can create an amazing scum-busting paste that rivals any store-bought bathroom scrub. 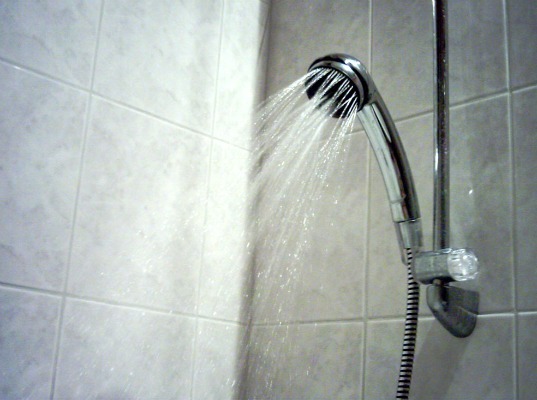 The paste works wonders at removing soap scum from shower doors, as well as hard water and rust stains on ceramic tile. Use a sponge or cloth to rub the paste into the surface until stains are gone, then wipe clean with warm water. To tackle stains on the grout, scrub the area with a toothbrush using the same paste. The paste can be somewhat abrasive, so use sparingly on delicate surfaces. To remove build up and mildew from the corners of your shower, spray the dirty areas with vinegar, and let it dry. Then spray again and wipe clean. The mild acidity of vinegar loosens the particles and kills bacteria. It’s much easier to prevent mold than to clean it, so it’s a good idea to spray down the shower after each use with a mixture of water and vinegar to prevent mold from settling in the first place. A scummy plastic or vinyl shower curtain can be cleaned in a number of ways. If it’s not too bad, simply spritz it with a vinegar and water solution, then wipe clean. You can also wipe curtain with a damp sponge and baking soda. For tougher build up or mildew, you should take the curtain off the hooks and lay it on a flat surface so you can scrub it clean. You can also toss the shower curtain in the washing machine. Instead of your regular detergent, use 1/2 cup of baking soda and a few tablespoons of vinegar. Make sure to throw a couple towels in as well, to help rub the grime off. 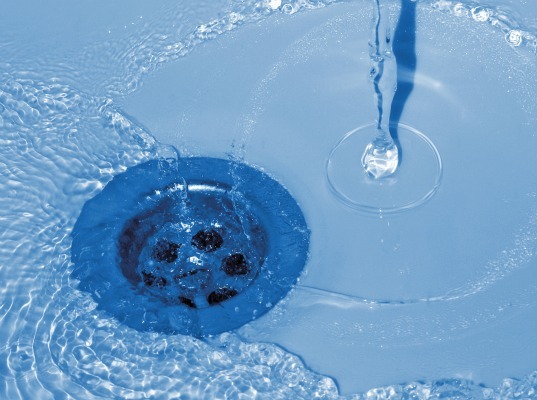 One of the most common causes of a clogged bathroom drain is hair, and the thought of pulling out clumps of tangled locks makes most people run for the Drain-O. But common drain cleaners pack a toxic punch. They contain sodium hydroxide and sodium hypochlorite, which can cause permanent damage to skin and eyes on contact, and the vapors can burn lungs. Many also contain dimethyl benzyl ammonium chloride, a severe eye and skin irritant, and dichlorodifluoromethane (uh, what? ), a neurotoxic eye irritant. So instead of pouring poison down your drain (which can also leak into the environment), you should create your own, non-toxic drain cleaner with baking soda and vinegar. First, remove any visible debris. Then pour about a 3/4 cup of dry baking soda down the drain, followed by a 1/2 cup of vinegar. Immediately plug the drain with a stopper or rag, and let it sit. The reaction from the baking soda and vinegar will break down gunk. After about 30 minutes, pour boiling water down the drain. Many of the methods we mentioned for cleaning the bathtub can also work for cleaning the sink, but often it’s less grimy, so you don’t need to use a strong scrub. Instead, you can make a spray cleaner by mixing two cups of baking soda, 1/2 cup all-natural dish soap, 1 cup water, and 1/2 cup vinegar. The mixture will cut soap scum and grime on most surfaces. Polish fixtures with a mix of equal parts vinegar and baking soda, then rinse clean. Toothpaste also works wonders on chrome fixtures. For a streak-free mirror, you can just use a clean, lint-free cloth and warm water. If you need a little more fighting power to breakdown the toothpaste splatters, mix equal parts water and white vinegar in a spray bottle, and spritz away. This solution can be used on all glass surfaces. Bathroom mats can get really grimy, really quickly. Never leave a wet mat laying on the floor; after every shower, hang it over the shower rod so it can dry out. To keep a bathroom rug fresh, sprinkle it with baking soda. Let it sit for about 30 minutes — or however long it takes you to clean the rest of the bathroom — then vacuum up the powder. This will help eliminate odors and allow you to machine wash the mat less frequently. To clean a tile floor, mix 1/2 cup of baking soda into a warm bucket of water and mop as you normally would. Add a little bit of lemon juice for a fresh scent. If your bathroom floor is small, simply wipe it with the same spray cleaner you used on the sink — no need to mop. Using earth friendly cleaning products certainly is a step toward a better bathroom, but your green efforts will be totally negated if you’re wasting water. As the world’s population continues to increase, water scarcity is becoming a pressing issue. Many of us have no idea how much water we use, and it’s a resource we take for granted. From running the faucet while we brush our teeth to relaxing with a long hot shower, we waste a lot of water in the bathroom. By switching to low-flow fixtures, you can save thousands of gallons of water. 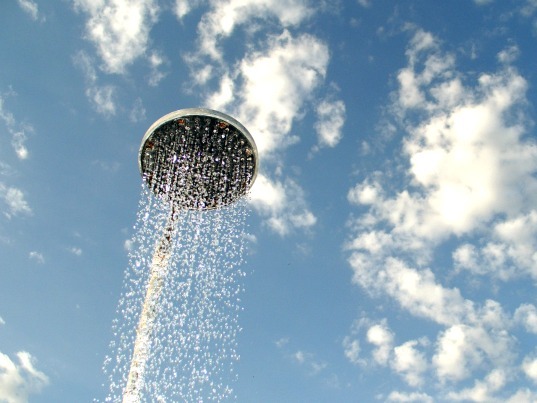 If the average family of four swapped their normal shower head for a low-flow model, they would save more than 20,000 gallons of H2O each year. Plus, investing in water-saving technology will lower your bills. For a truly green bathroom, you need to put water conservation first. Focused on doing away with dirty, Method was started to bring consumers environmentally friendly alternatives to the harsh chemicals traditionally found in cleaning supplies. Method’s founders, Eric Ryan and Adam Lowry, realized people wanted cleaning supplies they didn’t have to hide under the sink or in the closet, so they got started developing new alternatives to old standards like their latest hand wash and all-purpose cleaner featuring Powergreen technology. 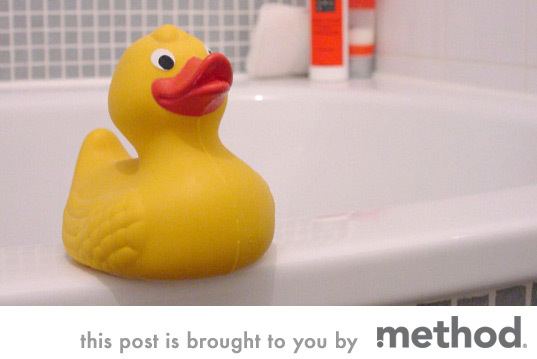 Don’t forget to enter Method’s Get Clean Sweepstakes! One lucky winner will receive a consultation with an organization specialist from Method and a year’s supply of Method cleaning products to keep their home sparkling clean. Hello, I wish you would have been more specific on how to make the cleaner for the vanities. I tried making it two different ways and once the baking soda and vinager touched each other a huge amount of foam came up and lasted about a minute. I just ended up with a mess and wasted those ingredients. I was really looking forward to making these because I like cleaning a lot and want to do it a safer way. I love cleaning green! Vinegar is my best freind! Almost everything in your bathroom can be cleaned with a high-quality microfiber cloth and water. Both e-cloth® and Norwex microfiber pick up more than 99% of bacteria with just water. For limescale the best thing I've ever tried is Norwex DeScaler. It's enzyme-based and wow, does it ever work fast. It beats CLR and all of those cleaners hands down. Unfortunately it was already very expensive and now for 2012 Norwex has introduced a smaller bottle size for the same money. You not only need to read the ingredients on your favourite cleaning products you need to re-read regularly. One label I dread to see on a favoured product is "new and improved" but they don't always let you know when they change the formula. Another great idea is using pre-made eco-friendly cleaning products like Nature's Source Scrubbing Bubbles Bathroom Cleaner. It's a great product that cleans with the trusted power of Scrubbing Bubbles while being gentle on the environment. You can get it here: http://www.cleaningproductsworld.com/natures-source-scrubbing-bubbles-bathroom-cleaner-drkcb701900.html at great prices with fast delivery! No one likes cleaning the bathroom; hair-clogged drains, moisture-loving mildew, and, ahem, the toilet all make for an unpleasant chore. No doubt your first priority when cleaning the loo is eliminating germs and soap scum, but it's important to steer clear of harsh chemicals that can linger in the air and water, and irritate your skin, lungs and mucous membranes. Just like in the kitchen, most popular disinfecting household cleansers are chock full of harmful chemicals. The EPA classifies 275 of the antibacterial agents commonly used in cleaners as pesticides, some of which have been linked to serious health problems. In the bathroom, we're constantly coming in contact with all kinds of surfaces, so these toxins can easily get on your skin, and with the next flush of the toilet, the chemicals will flow into the wastewater system, where they can seep into the ground. With diligence and earth-friendly products, you can keep your bathroom clean -- and safe -- without harsh chemicals.